My mother was more of a cook than a baker. Though she had a limited repertoire of baked goods, the things she made were delicious. She was also a strict recipe-follower, so her baking was very consistent. Her signature cake was a chocolate-chip cake that my sisters and I still make. The other cake I remember her making frequently, starting in my teen-aged years, was Carrot Cake. Her recipe was from the classic James Beard’s American Cookery (now out of print). As with her chocolate-chip cake, she baked it in a 13×9 pan and slathered it with cream cheese frosting. Whenever I imagine eating a carrot cake, it’s hers I dream of. 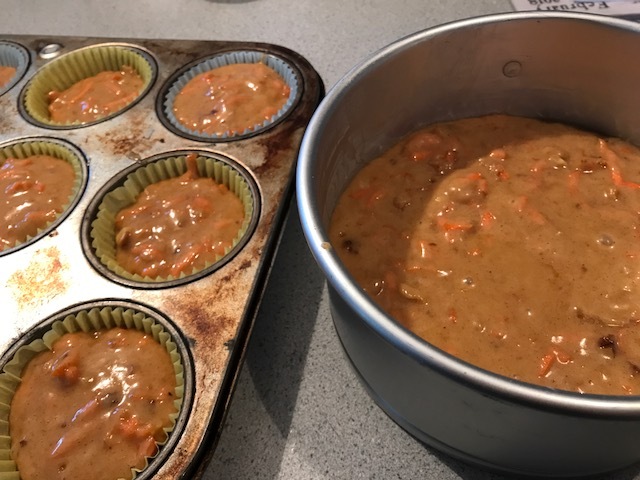 It was a basic carrot cake with grated carrots, warm spices, and nuts. 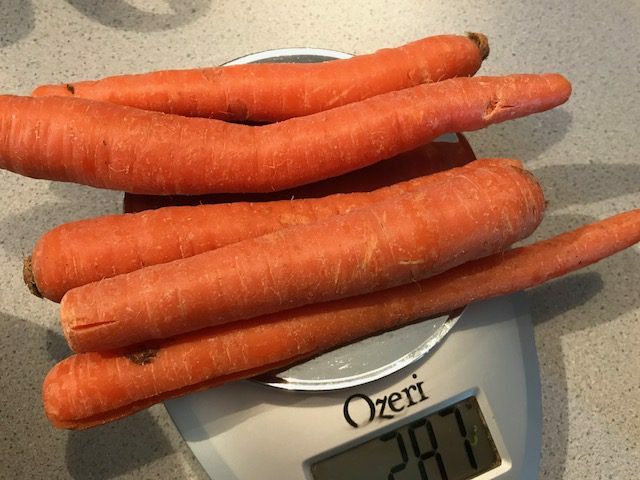 There were none of the extraneous ingredients that carrot cake recipes often called for, like crushed canned pineapple or the dreaded (to me) shredded coconut. As you might expect, Howard is not a fan of carrot cake. That means I haven’t made one in decades. I seldom eat it out, usually choosing something else because of the frequent appearance of those extra ingredients I mentioned before. 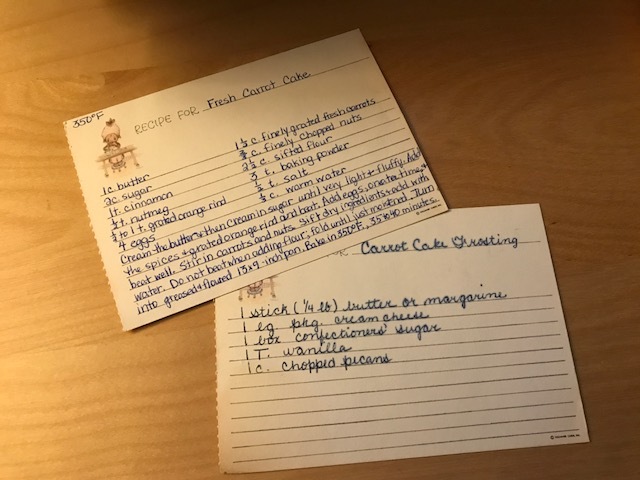 When I saw that this week’s recipe challenge with my friends at Cook the Book Fridays was the Carrot Cake from David Lebovitz’s My Paris Kitchen, I had mixed feelings. However, on closer review of the recipe, I was reminded of my mother’s cake. Just the basics. The main differences between David’s cake and my mom’s (and James Beard’s) were few. David’s cake is enriched by vegetable oil and buttermilk instead of butter and warm water. My mom’s cake added grated orange rind. Otherwise, they were very similar. I didn’t want to make a whole cake. Initially I thought I’d make half a cake as my friend Ro from Chez Nana ingeniously did, but I wanted to be able to share it more easily. After looking up cake volume conversions, I decided to make cupcakes instead. According to the handy chart I found, batter for a 9-inch cake pan would make 9-12 cupcakes. Perfect! Or so I thought. The full recipe must make one massive cake. I filled all twelve of the cavities in my muffin tin and had enough to batter left to fill a 6-inch cake pan as well. The cake is quite easy to mix together with a whisk and a rubber spatula. The resulting cake is moist and tender. 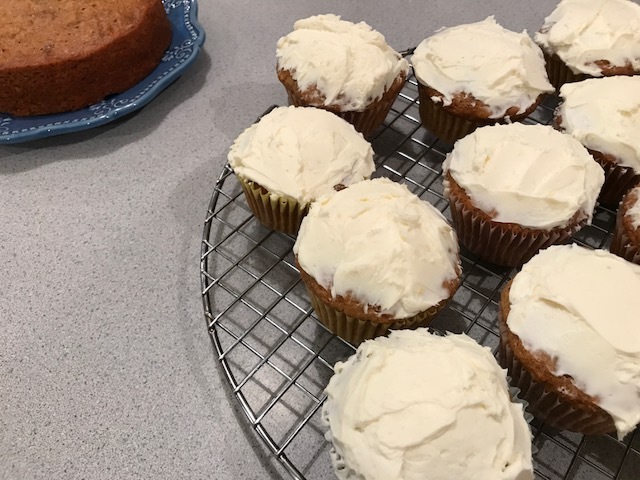 I used the stand mixer to mix up the mascarpone-cream cheese frosting. 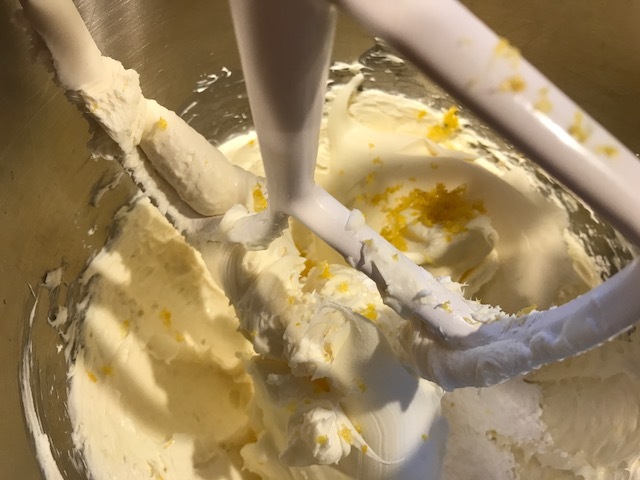 I loved the tang of the frosting, and it is much less sweet than my memory of my mom’s frosting. As you can see, I’m not the most talented froster. I can’t remember the last time I made a layer cake. When I make cakes, I usually leave them unadorned or sprinkle them with powdered sugar. I shared some of the cupcakes and have been working my way through the single layer cake. Though it’s a different recipe than the one I dream of, it came out just the way I like it, taking me for a delightful trip down memory lane. 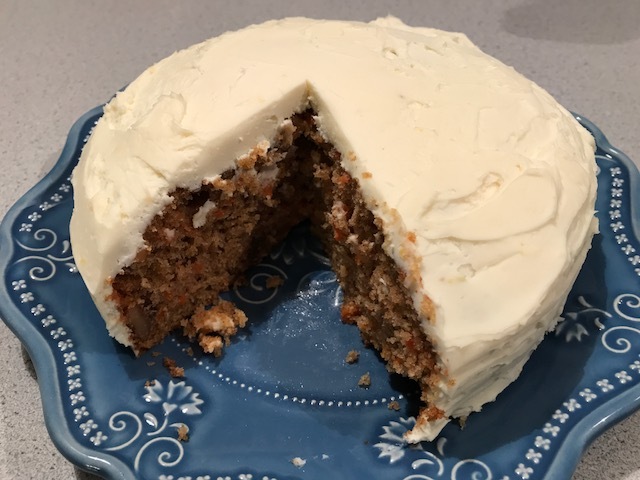 While I can’t say carrot cake will make frequent returns to my kitchen, I did like this recipe enough to make it again. Revisiting my mom’s recipe, I think adding orange rind to this recipe could only improve it. I noticed she added nuts to the frosting AND the cake. That might be an interesting variation as well. And for minimal fuss, I would even try baking it in a 13×9 pan. As a side note, David Lebovitz’s memoir l’appart has finally bubbled up to the top of my pile. I bought a copy in December (and met him) when he came through Boston on his book tour. I’m about halfway through. It is very entertaining, though I doubt I would ever be able to face purchasing property or doing a home renovation in Paris. I bookmarked a few of the recipes in the book to try. If I’ve inspired you to try out David’s Carrot Cake, you can find the recipe on page 277 of My Paris Kitchen. To see if my Cook the Book Fridays friends enjoyed their cake, follow their links here. February snuck up on me. The week started out as January, and then, hello, here comes another month. The first Friday means another recipe for Cook the Book Fridays. I am so glad that the selected recipe is one that couldn’t be easier. Black Olive Tapenade can be prepared in just minutes from ingredients that I always have on hand. 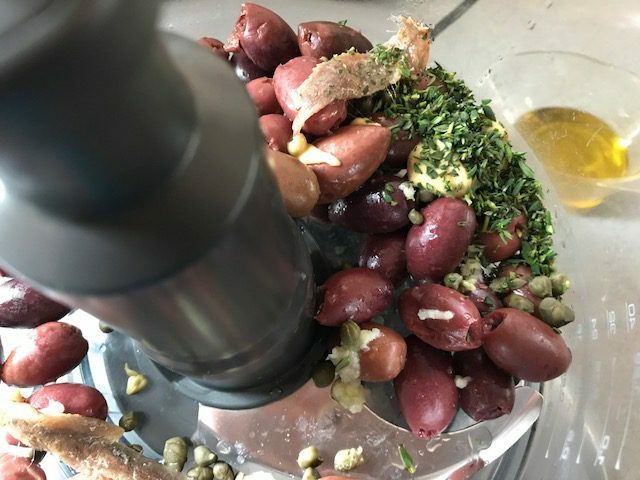 Pulse together pitted Kalamata olives, capers, anchovies, garlic, fresh thyme leaves, and Dijon mustard in the food processor. Then add olive oil and whir until the mixture is somewhere between chunky and smooth. That’s it. Mine was already on the salty side so no additional salt was needed. The salt flavor also mellowed overnight. 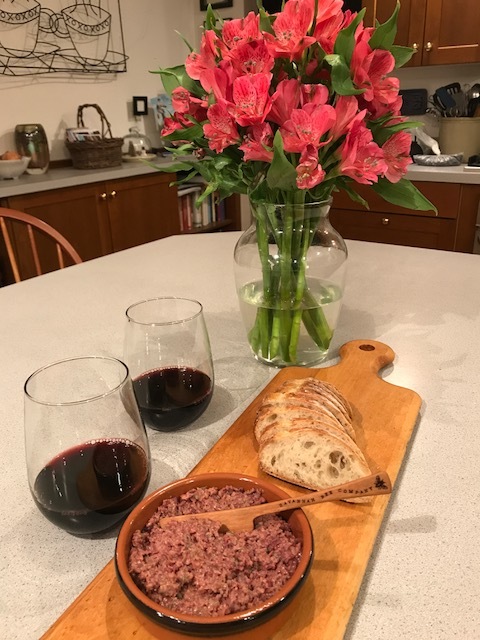 Served on fresh baguette slices with a glass of red wine, tapenade was the perfect Friday night pre-dinner appetizer. 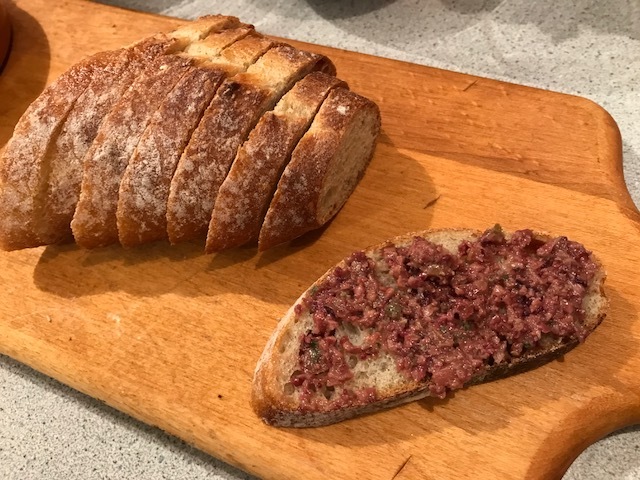 I think I make a different tapenade recipe each time the mood strikes, but this one, from David Lebovitz’s My Paris Kitchen is a keeper. See what my friends thought of this recipe by following their links here. I look forward to enjoying the leftovers, maybe on Super Bowl Sunday, along with other snacks. I hate football, but I love food holidays. Even though the local team is playing, I won’t watch the game (but I will watch the commercials). And, per our tradition (and much of America’s), we’ll make a chili dinner. Happy Groundhog Day all! Punxsutawney Phil saw his shadow, so maybe six more weeks of winter. Apparently, he’s not the only predictor. I heard of other groundhogs in New York and Canada that variously agreed or disagreed with Phil’s prediction. It’ll be what it’s going to be. I also heard that this year marks the 25th anniversary of the Bill Murray movie “Groundhog Day”. Time does fly.